Onions are an essential part of Japanese dishes such as Japanese curry and nikujaga stew. Japanese people consume almost 1.2 million tons each year. 117 tons of onions were grown in Japan in 2014 – and 60% of them came from Hokkaido. 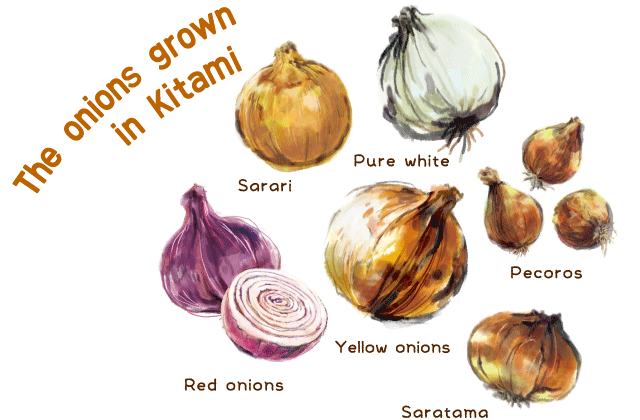 Kitami grew and shipped 210,000 tons – 20% of all the onions produced in Japan. Kitami is Japan’s top producer of onions, and its onions are eaten all around Japan. Hokkaido’s first onions were grown in Sapporo in the mid to late 19th century. Kitami grew its first onions in 1917, and its onion industry grew in the years after World War II as its peppermint industry declined. Kitami’s cold climate is perfect for onions, and onion farms sprouted up throughout the city, resulting in Kitami’s current status as Japan’s top onion producer. In spring, you’ll see geometric shaped ridges in fields all around the city, where the onion seeds have been planted. 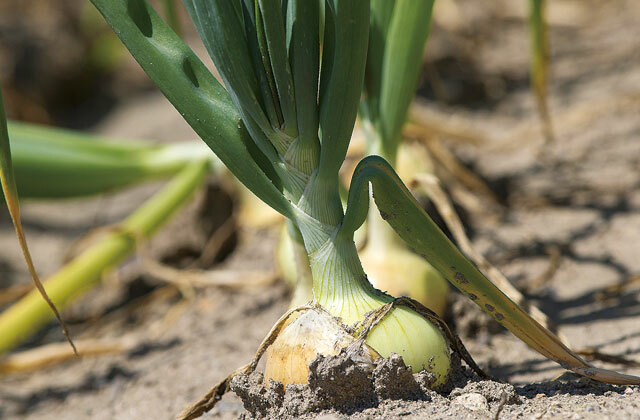 The onions grow and grow throughout the summer, then when the autumn harvest season arrives, you’ll see big containers under blue or orange tents in the fields. The seasonal views of Kitami’s onion farms from National Highway Route 39 are some of the most iconic landscapes in Hokkaido. Kitami has little rainfall and a large variation in temperatures between the seasons and even within one day. This produces firm onions whose sweetness increases with cooking. In addition to its ideal climate, Kitami became Japan’s top producer of onions through clever planting techniques. Kitami onion farmers stagger their seed planting so that onions can be shipped continuously from August to April. Seeds are planted in snowy, cold February and grown in vinyl greenhouses before the seedlings are planted in the fields in April. Various forms of care take place during each season, from weeding and root cutting to harvesting and drying. 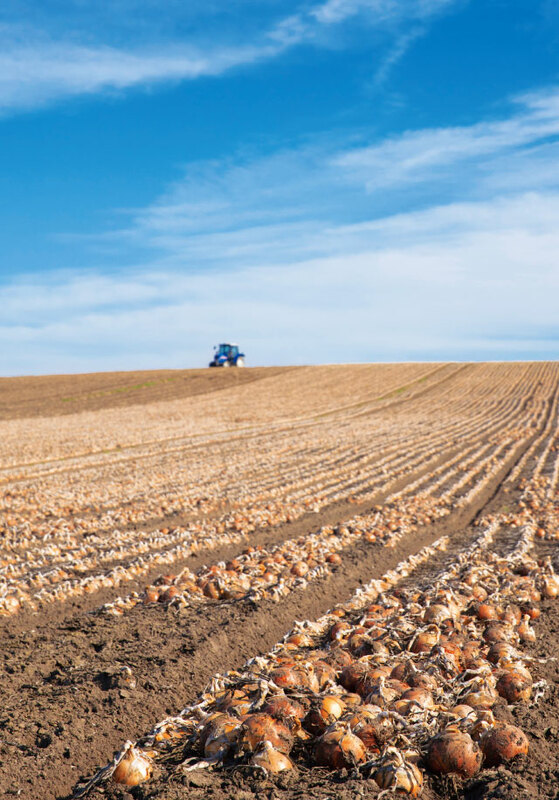 This loving care from the farmers, along with advances in farming technology and improvements in onion species, has made Kitami the top producer of onions in all of Japan. Kitami onions are enjoyed in households all over Japan. These pretty white onions are only 1/3 as strong in flavor as ordinary onions, giving them a rare sweetness. These new onions can be eaten as they are, giving you extra nutrients that would otherwise be washed away by water. 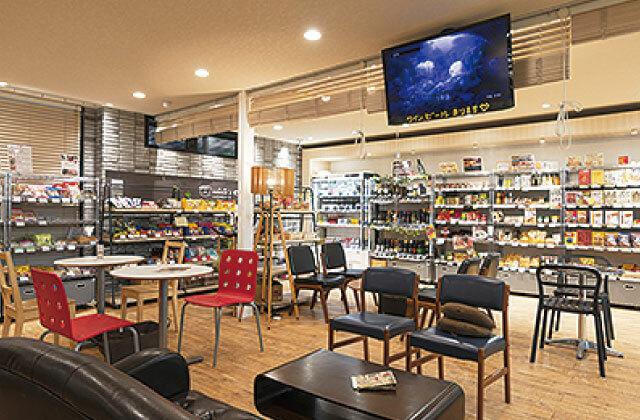 Buy JA Kitamirai products from the permanent shelves in one area of the café. 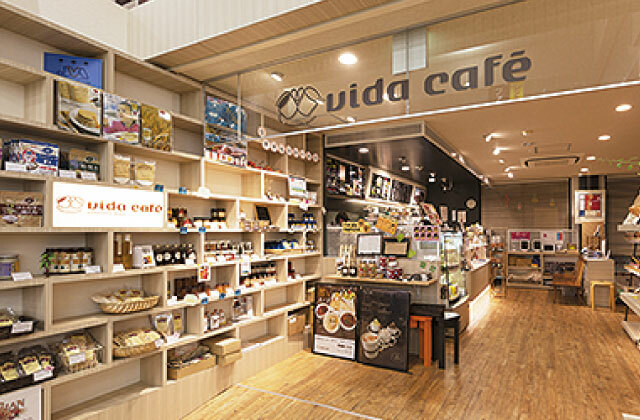 Next to the fine products from around Japan and overseas is the café area where you can sit and relax. A cherished part of the community! This café takes the utmost care with all of its ingredients, from its coffee beans and fresh milk to its tea. It also sells products made by and for locals by a bagel store and bakery in the neighborhood. The café sells around 100 different retort curries from around Japan, and will even cook and serve them for you so that you can enjoy them on the spot. 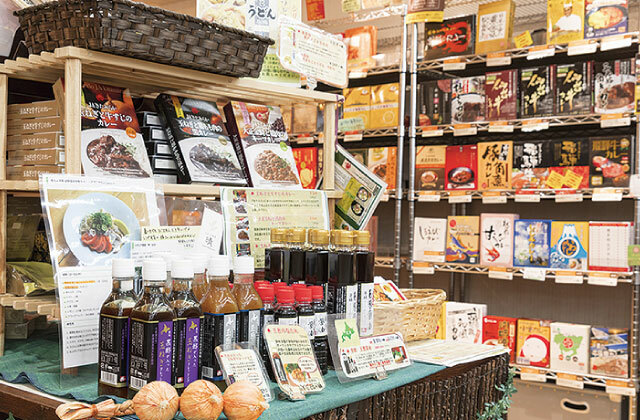 You can also buy original processed goods from JA Kitamirai, made from Kitami onions and other local produce. 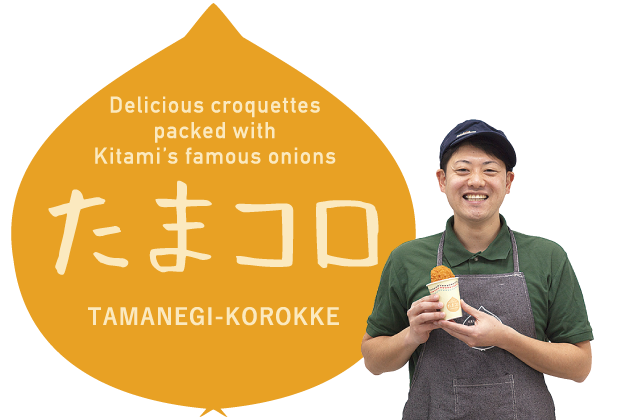 Packed with flavorful Kitami onions! In 2016, Tamakoro onion croquettes won a prize at the 4th National Croquette Festival in Ibaraki. 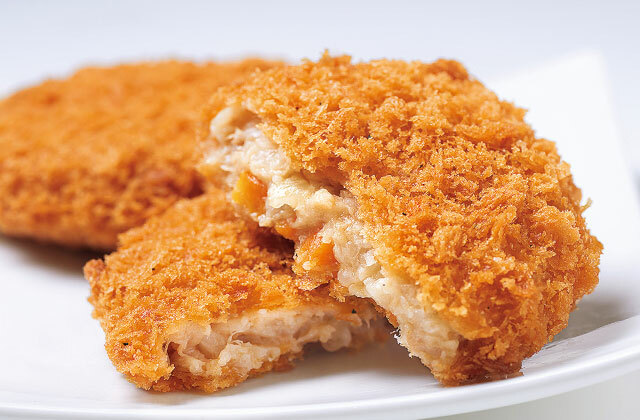 Thinly sliced Kitami onions are the main ingredient in these delicious croquettes, along with tuna, carrots and mayonnaise. These croquettes don’t have the potatoes and cream that are usually used in croquettes, giving them a unique taste that combines creaminess and juiciness and allows the savory-sweet taste of the onion to be the main focus.The hugely popular croquettes are made by Greens Kitami Co., Ltd., a local produce processing company, and are one of Kitami’s signature dishes along with onion soup. You’ll find them in the frozen foods area or household foods area of supermarkets in Kitami. They’re also sold in some of Kitami’s restaurants, so you can try them ready cooked!